Great American Standards, Boogie Woogie, R&B and Rock n Roll all summarize the music of Kathy Morrow. From swingin' jazz tunes to sultry blues and a sample of her own originals this singer/pianist likes to mix it up. Kathy has been performing nationally and internationally for the past twenty five years. She's worked in Detroit, Chicago, Stockholm, Copenhagen, Berlin, Zurich, and Hong Kong, just to mention a few! What's your preference? Spontaneity is her strong suit. Feel like Adele or Jobim...just ask...she's got you covered! Disco City!! 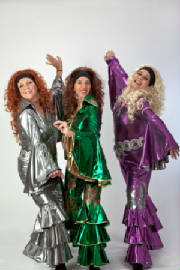 Put on your dancing shoes when you come to our Fabulous Femmes show. You won't be able to sit in your seat! We perform a 60's, 70's and 80's sets of music. Eliane Elias "Light My Fire"
Renee Marie "Black Lace Freudian Slip"
Gerald Albright "Sax For Stax"
Oscar Peterson "We Get Requests"
Earth, Wind & Fire "The Best of..."